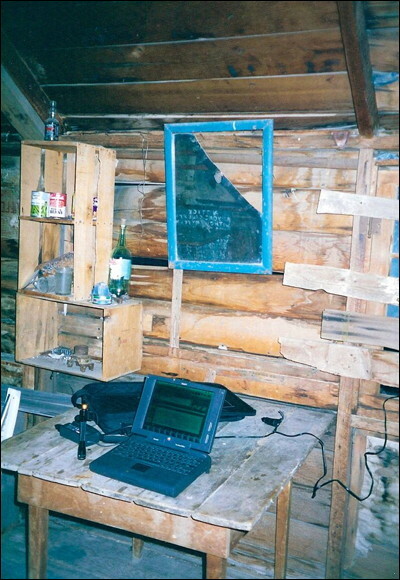 This is inside the old shack at the Lost Burro Mine in Death Valley, sometime in the 1990s. The power cord ran out through the wall and several feet down the slope where it plugged into the cigarette lighter in the rig. Note the mini-mag flashlight taken apart and stood on end, transforming it into a AA candle. Night was coming on, the Mac was fired up, ClarisWorks open, and I was ready to write some good desert stuff. Coyote had been yapping on the ridge for an hour. It was time!